And am I ecstatic that they sent me word about their resto or what? Extremely fantastic timing. \m/ When we didn’t know where to eat that evening, we decided to find out if we’re saint or sinner at this newly opened resto just after the Welcome to La Trinidad arc. A little after our short conversation with the chef, one of the attendants approached us with a slice of cake. She told us that they wouldn’t let us go without tasting one of their best sellers. One forkful, and Race and I went, “how’d they do that? !” The kamote cake we just got our chompers on was exactly, eggXactly like the kamote ice cream sans the chill. Damn, man! Creamy, light like a cloud, almost as if it wasn’t cakebread but with a little roughage of the root crop here and there. The only non fruity thing we got for our second wave, so to speak, is the Irish coffee (which we were expecting to be a hot drink but wasn’t, but no biggie. They must’ve put a space there when they were typing out the menu and so it moved under hot bev). I’m adding the cheese cake to my list of well made cheesecakes. Wee! Not intensely cheesy but blueberry cheesecake nonetheless. The baked/toasted top of the cheesecake reminded me a bit of the Japanese cotton cheesecake. And that crust … nyum! The guyabano yoghurt, and the mango orange ice cream gave the sensation of flavors bursting in the mouth just when they’re swallowed. Sip, sip, sip of yogurt and the millisecond it reaches the throat, the guyabano taste shines through. Spoonful of ice cream and it’s more mango as I melted it in my mouth and again, a fraction of a second to the swallowing, I got an explosion of orange freshness. *Bsheeew! Saint or sinner, it doesn’t really matter; I’m marking this cafe for good food. So good, feels like heaven on earth! Price: Says there in one of their decor thingies that ‘cheap cake isn’t good’. Kudos to Sinner or Saint Cafe for still keeping their scrumptious cakes reasonably priced. Lab, lab, lab! Please TAKE NOTE: AFTER Welcome to La Trinidad arch when you’re coming from Magsaysay Baguio. They have a sign on the building before the arch but it’s actually pointing to the next building, just a few steps away. 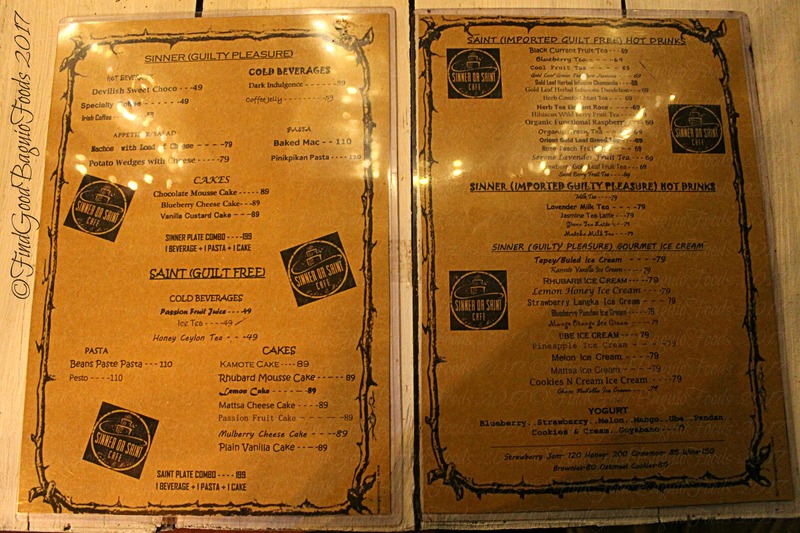 Sinner or Saint Cafe looks more a dessert place because of the ice cream and cake selection on the menu. No way you can be a saint here. *heehaha I know what you mean, lån. I was really floored seeing that selection at Sinner or Saint Cafe. For sure, induced to gluttony, I wanted to try everything right there. Hello, Pauline B.! I know right. It was overwhelming in a way and such pressure to pick out which to try first. Time to study this La Trinidad cafe’s menu. I think we ahve another great post and another great find in Sinner or Saint Cafe.Their ice creams and cakes are very intriguing and sound delicious. I think Ill be a sinner in this restaurant. Tnx for your very informative blog. Hello there, Alysa! Once in a while indulgence courtesy of this metro Baguio La Trinidad cafe. I’m gunning for the passion fruit cake and the strawberry langka ice cream next visit. Hello there, Lina! I’m excited to try that particular flavor on our next visit to Sinner or Saint Cafe. The suspense is killing me. *hihi And yes, let’s do try everything at least once, so we know ourselves (if the combo does work or not). is this cafe open on Sunday? Hi! We tried Sinner or Saint’s strawberry and langka ice cream the other day. By god, IT WORKS! It was a taste explosion, nothing overpowering the other but actually came together like a new fruit entirely. Impressive. Try, try!